Play therapist want to create a play therapy room that is a safe and special place for their play therapy clients. My play therapy accessories are just as important as the play therapy toys I put in my play therapy play room. Below are some examples of the special play therapy activities I have placed in my play therapy room. They are all inexpensive or easy to make. The below example is a bouquet of play therapy flowers for my clients to see when they walk through the door of my play therapy room. This sets the tone for a "warm and friendly" experience. I found these flowers at the dollar store. They also make great play therapy wands. This is a basket filled with my "warm fuzzies". These little creatures are the staple of my play therapy and play counseling experience I give to clients. Warm Fuzzies are inexpensive to use. They work for seperation anxiety, nightmares, stress, and more! 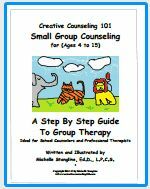 They are the perfect play therapy staple for your clients. 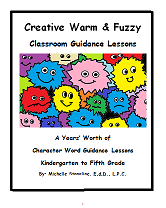 See "Warm Fuzzies" warm up for ideas to use these wonderful little beings in play therapy. 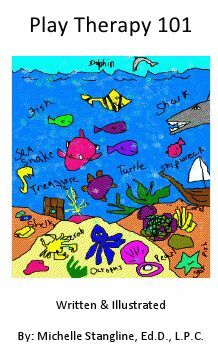 For my play therapy room I decorate it with my own personal play therapy art work. 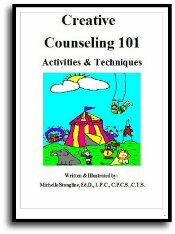 In this way I can use examples in play therapy without breaching confidentiality with client work. 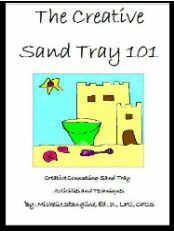 It also helps me to remember great play therapy activities to use with my clients. My theory is that if you are going to use play therapy on clients, you had better do it on yourself first! As you can tell I use a lot of play therapy on myself!!! I like to make a little joke with my play therapy graudate students about wands. I tell them the universities I graduated from forgot to give me the magic wand for therapy. The truth is there is no magic wand in therapy, although sometimes I think people expect me to have one to fix their problems. So, I like to have a lot of play therapy wands floating around. These wands are colorful and can be used for many activities. See "Play Therapy Wands" for more ideas. I make my own puppet holders in order for my play therapy puppets to be shown to clients. They are easy to make. Just cut some wood and dowels to the size you want. Then take a drill bit and drill a hole. Fix the dowel in the hole with glue. Allow to dry.